is a powerful leadership book that overflows with concepts and philosophies that will build winning teams and create a happier, more personally fulfilled and enlightened life. 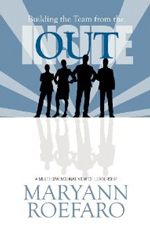 This book is a recipe for self-mastery that Maryann intuitively inserts into the workplace. Any and every leader with an open mind should read this treasure. She believes that every relationship we have begins with the one we have with our self. She has proven that the success and harmony of any workgroup or corporation is dependent upon the mastery and resilience of its individual parts. Join Maryann on a journey of leadership development, proven through over 25 years of experience that will change the way you look at challenge, adversity and the interconnectedness of people. Purchased book for work related issues and found it is great for personal relationships as well. Book is well written and shows that the foundation of teamwork is great leadership. Ms. Roefaro shows that by applying her principles you can maintain a great workplace for everyone. And applied to personal issues, the principals work just as well. This book is the whole package. As I read this book, I learned as much about myself, as I did about building a team. The author grabs your attention in the first paragraph and never stops. I had a difficult time putting this one down, curiosity of what was on the next page kept me reading for hours. This book really helps leaders to understand what work needs to be done in order to have a strong, cohesive team. Be prepared to highlight several areas of the book, as you will want to incorporate these powerful, relatable messages into your day to day interactions with your team. Open-minded leaders take note - this book will help you take yourself and whomever you lead to higher levels! Leaders desiring greater cooperation among their troops will find this book chock full of new ideas on how to take care of themselves first so that they can be better equipped to be helpful to those they lead. This book may have been written with the workplace in mind, but it will absolutely help any reader become more effective in any role - whether it's business person, parent, partner, coach or friend. As a former business owner and leader of 135 employees, I can't help but think, "I sure could have used this book 20 years ago!" This book is a must read for anyone who is a leader or aspires to be a leader. This book will open your mind up to new ways of looking at yourself, your leadership style and your team. The book itself is written in a conversational tone. It is easy to read and feels as though you are in a dialog with the author over a cup of coffee. Several key themes emerge which are in stark contrast to other leadership books. Specifically, the author invites you to change your world by contemplating the style in which you think and perceive yourself and others. The focus is on the leadership journey through self mastery. The author says, "An outstanding leader needs outstanding self-control, most notably, self control of the ego". The author encourages you to release the ego and become the master of your thoughts, reactions and responses to real life leadership situations. Also, the back of the book is filled with an invaluable set of tools, called 8 ½ X 11's that leaders can use in their workplace to foster a more harmonious, fulfilling and effective work environment and develop an organizational culture of cooperation and teamwork. This book is for people who care deeply about being leaders and has the capacity to inspire you to bring out the best in yourself and create a positive impact within your team and your organization.